I’ve missed making breakfast on the weekends. Part of this is due to the running regimen that we began at the beginning of the year as we train to run a 10k – we get up on the weekends, run, and I’m too tired and hungry to spend time cooking. Another, smaller part of this is because I haven’t been planning ahead like I used to. But I finally got to make this recipe for Blueberry Scones with Lemon and Almond. One morning I woke up early enough and we weren’t going for a run. Breakfast time it was! I’ve made pancakes often recently because they’re fast and I always have the ingredients on hand for them. However, on this morning I glanced at my RSS reader before breakfast and saw the recipe for Blueberry Scones. They didn’t simply have blueberries in them – the recipe called for lemon oil or zest and almond extract as well. I made the recipe more or less as written. My flour seemed dense, so I tried to measure it lightly. (So I’ve added weights below.) I added frozen wild blueberries, which were nice because they’re smaller and distribute throughout the dough more evenly. I used nonfat plain yogurt, and lemon extract in place of lemon oil. The dough seemed too dry to drop, so I decided to add milk (since I thought yogurt wouldn’t mix in very well). In retrospect, I should have just kneaded in the rest of the ingredients by hand, briefly, but I didn’t. I added at least 2-3 tablespoons of milk until the dough was sticky. Since I’d added all that extra milk, I didn’t bother with brushing the tops of my scones with milk or cream. I plopped 12 scones on a baking sheet, sprinkled them with sugar, and baked them. I had my oven preheated to 375F, but since my oven is old and finicky, it warmed up to at least 400F by the end of baking time. (And that’s with me setting my oven temperature at 350F. Ugh.) I baked these the short time 20 minutes exactly, in spite of the extra moisture, since my oven was warm. These scones were definitely more muffin-like than scone-like. 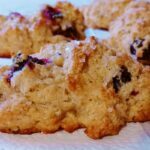 They were less dense than other scones I’ve made – lighter and fluffier. I was disappointed that they didn’t brown on top this first time I made the scones, because I really enjoy the contrast between browned scone top and the tenderness inside. The top and the inside had the same tender texture. The flavor, however, was great. The lemon and almond extracts complemented the blueberry very nicely. Not satisfied with my execution of the recipe, I tried the recipe once again. This time I didn’t add in the extra milk. I baked them the same as before. They browned slightly on top. The texture was still soft and muffin-like on the inside. 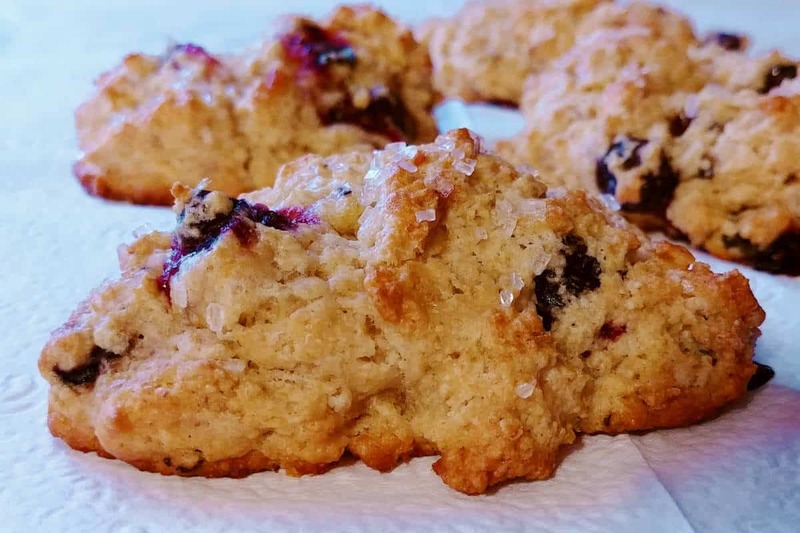 The flavors of lemon and almond accented the blueberries really well and made the scone bright. Using wild blueberries meant that I got blueberry in every bite, but using regular blueberries meant that each blueberry I had was bigger and juicier. Overall, I really enjoyed these scones. I loved the flavor combination, which reminded me a lot of cookies I used to make. Something I might try next time: substituting a little almond meal or finely ground almonds for some amount of flour, to compliment the almond extract. Like this recipe? Leave me a comment below! You may also like Sprinkle Scones or Blueberry Muffins. 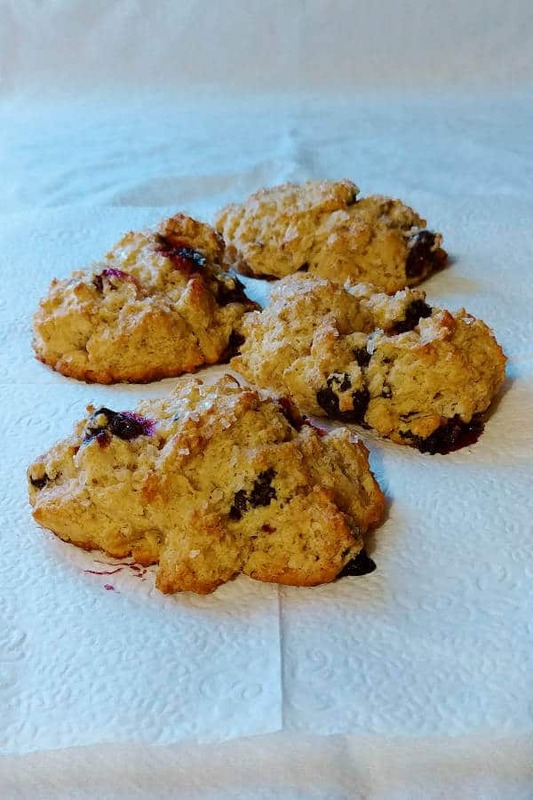 This delicious, muffin-like drop scone recipe has lemon zest and almond extract, making a normal blueberry scone pop with extra flavor. Combine flour, sugar, baking powder, and salt. Use a pastry cutter or two knives to cut the butter into the flour mixture. Stir in lemon zest (if using). Stir in blueberries. In a separate bowl, whisk together eggs, yogurt, vanilla, and almond extract (and lemon extract, if using). Pour mixture into the flour mixture and use a fork to gently stir the dough together. It should be wet, like cookie dough or muffin batter. Add more milk, 1 teaspoon at a time, until no dry bits remain, but be careful not to overmilk. Scoop scant 1/4 cups onto a parchment or Silpat-lined baking sheet, placing them 2 inches apart. (I used a #40/ 1.5 tablespoon scoop and scooped two level scoops per scone.) You will need 2 baking sheets. Bake at 375F for 15-25 minutes, rotating the pans between racks halfway through baking. My scones baked for 18 minutes, but I could have done with a little less baking time. Serve warm. Store in an airtight container. These scones turn out best if you weigh your flour, instead of scooping it. If you scoop, you run the chance of getting too much flour into your scones; you will need to add a little milk to the dough, or the scones will be dry. 240 grams of flour for me is 1 3/4 scoops.